Follow this tutorial to create an easy, lined half-apron for just about anyone, children or adults. This apron . For both options, trim the seams and clip the corners (Pic 4 & 5). Turn right side out and press the bottom seam allowance up inside the pocket (Pic 6). Press whole pocket (Pic 7). features a contrast lining, a handy pocket, gathering and a waistband. 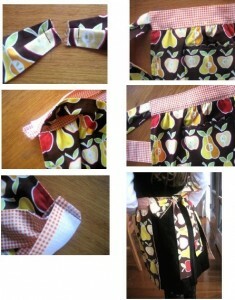 Sew this apron for a gift, along with a cookbook. The Basics Measurements: these are fairly loose and can depend on how much fabric you have and the size of the person. I know that sounds vague but really, as it ties up it can fit lots of different sizes. I have written metric measurements. 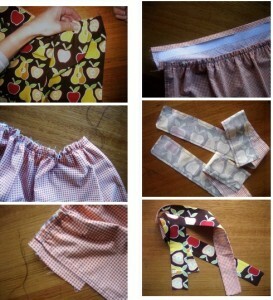 You need to cut 1 skirt, 1 skirt lining, 1 waistband, 1 pocket, 1 pocket lining and 2 ties and 2 tie lining. For the skirt and skirt lining: Length: Measure from the waist to the desired length. I don’t like these aprons to be too long – just above the knee should be perfect. Width: Measure from one side of the backaround to the other side of the back so that you leave a gap for the bow to sit. You don’t want it to cross over at all or the apron will be too big and won’t tie properly. You then need to add extra to the skirt width to allow for the gathering. Again this can depend on how much you want it to gather or how much fabric you have. You may not want it to gather at all which would also be fine. Just leave out Step 4 and cut the skirt the same width as the waistband. Then add a seam allowance of 1.5cm. For the Waistband: Use the same waist measurement for the length of the waistband. For the width 4-5cm is plenty for a child but you may wish to make the adult one a bit wider – anywhere up to 6-7cm wide. Again this is personal choice. Then add a seam allowance of 1.5cm. Ties and pocket: For the pocket it really depends again on how large the person is and how big you want the pocket to be. The finished size of this pocket is 15cm. 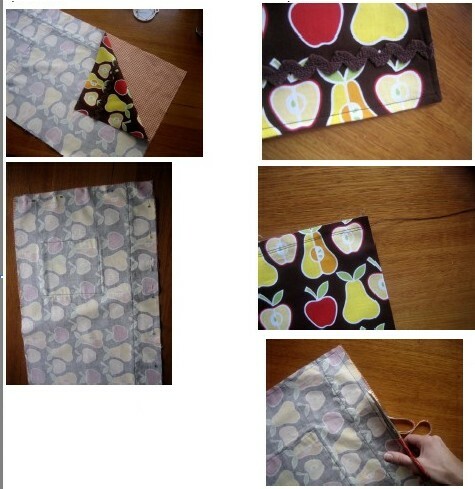 You will cut two pocket pieces – one out of the lining and one out of the main fabric. For the ties you need to make them long enough to tie and not so long they hang down. I think around 60-65cm ties are fine. These ties are 5cm wide finished. Remember to add on the 1.5cm seam allowance. This particular version uses the lining and the main fabric – so cut two ties from the main fabric and two from the lining fabric. There were my apron measurements: 33cm from waist to just above the knee and 56cm around the waist to the mid side back. I then added the seam allowances of 1.5cm on each side and top and bottom and an extra 13cm for the gathering of the skirt. Skirt & lining= 36cm x 72cm 56cm waist measurement plus 1.5 seam allowance. The width is 4cm x 2 (because the waistband is folded) plus seam allowances. Waistband = 59cm x 11cm Ties = 66cm x 8cm Pocket & lining = 18cm x 18cm. Attaching the pocket Pin the pocket to the apron front. When positioning, make sure you allow for when it is gathered. Stitch. I have added a row of ric rac at the bottom of the apron which is also optional. Pin in the position you want it and stitch. The apron skirt With right sides facing pin the lining to the apron front. Stitch. Trim seams and clip the corners. Turn right side out, making sure you push out the corners properly, and press. At this point it is optional whether or not you top stitch. I liked the look of top stitching on this apron. Gathering the skirt Set your machine stitch length to a long stitch. Without back stitching at the start or the finish sew across the top of the apron skirt. Repeat this just inside the first row of stitching. Stitch. Trim seams and clip the corners. Turn right side out, making sure you push out the corners properly, and press. Take the bottom thread of each row of stitching and holding the apron skirt pull into a gather. Do this on both sides of the apron skirt until the apron fits the width of the waistband not including the seam allowances. ne. This is completely optional. Just cut a piece that measures half the waistband and iron on. With the right sides facing pin the waistband to the apron skirt making sure the gathers are even. Stitch. Making the ties With right sides facing pin the ties together leaving one end open. Stitch. Trim seams and clip the corners. Turn right side out, making sure you push the corners out properly, and press. Pleating the ties To fit the ties into the waistband, I sew in a little pleat at the top of the tie. 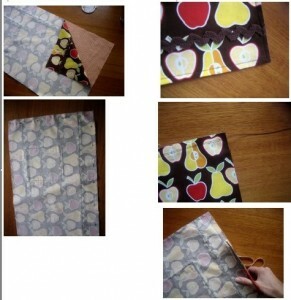 Just fold and stitch,making sure they are opposite and don’t go in the same direction – see the picture. 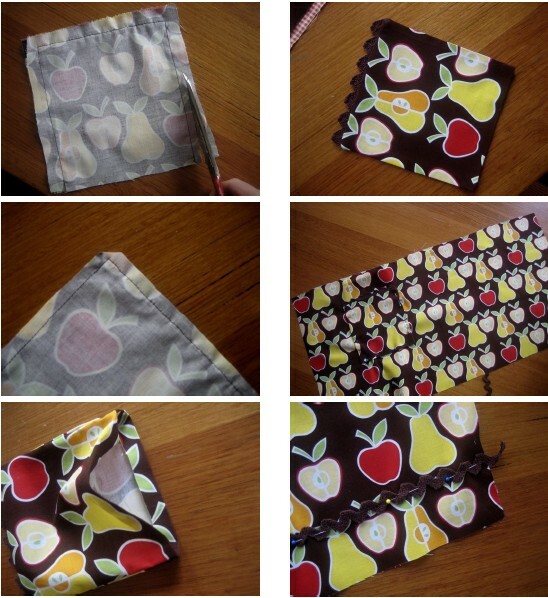 It is now optional whether you hand sew the waistband to the apron skirt lining or top stich it down. On this apron I have top stitched it all the way around. Again it depends on the look you want or how much time you have etc. Attaching the ties to the waistband Fold the waistband in half with the right sides facing. Pin each side sandwiching the ties in the seam. Stitch. Trim the seam and clip the corners. Turn the waistband right side out and press.